Bungie released Halo: Combat Evolved for the original Xbox about a decade ago and in subsequent games they've worked to improve and enhance that formula that game established. 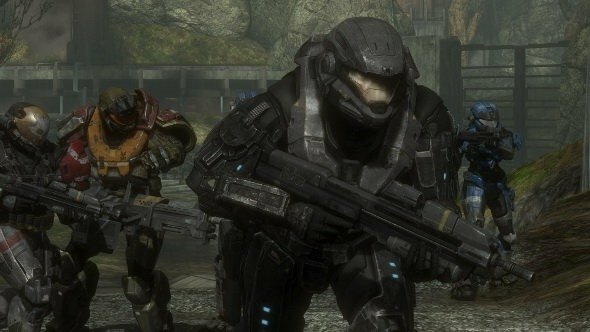 Halo: Reach, the last game they'll develop for the franchise, is a culmination of these efforts. It's the most polished, complete Halo experience yet and should keep fans well-occupied while the series' new developer prepares to step in. Reach takes place just before Combat Evolved. For the second game in a row, Bungie opted for a narrative without Master Chief. Players instead control Noble Six, the latest addition to a squad of Spartan super-soldiers known as Noble Team. The Covenant have assaulted the human colony of Reach and it falls to Noble Team to blunt their attack. While this may feel like a side story like Halo 3: ODST, it does have meaningful ties to the plot of the Halo trilogy. Noble Six shares Master Chief's general lack of personality. The other squad mates are more distinct characters. Unlike most squadmates in shooters, I actually remember their names. There's not much time to become acquainted with these characters, though. The invasion of Reach begins early in the campaign so the squad has very little down-time. They're hopping from one battle to the next. It's too bad Bungie couldn't find a way to give us more exposure to their personalities. I cared enough about them that I didn't want them to die but it seemed like there was untapped potential. If nothing else, you have to admit Noble Team looks cool. Each has a set of custom armor with different parts, colors, and ornamentation. 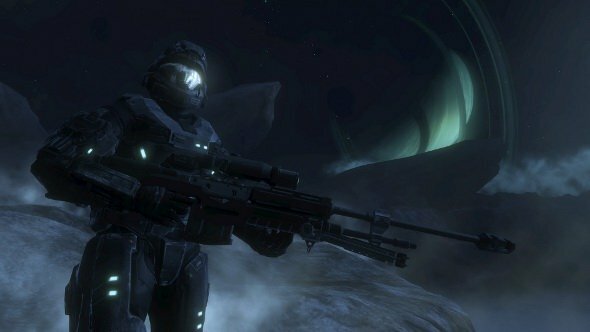 If you've followed news about Reach's development, you've probably heard this fun fact: a rifle in Reach has more polygons than an entire Marine in Halo 3. I have no way of checking that but the truth is, everything just looks sharper and more detailed than it did in previous games. They've even managed to make the Grunt look cool for once. There's some strain in processing these new visuals - the frame rate took a dip in a few spots - but it wasn't enough to detract from the experience. Ultimately this is one of the best-looking games ever released on the 360. 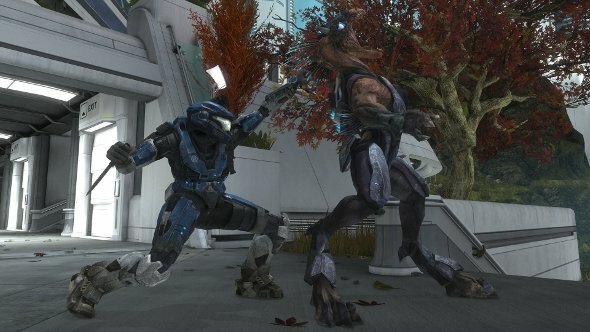 It's no wonder the graphics engine has some occasional trouble keeping up with the action; Reach's campaign maintains the blistering pace of predecessors. Each of the ten missions feels like one prolonged battle. Rail shooting, vehicle, and corridor shooter segments lead to large shootouts in sprawling environments. There are also a few moments where you're asked to defend an objective - a sort of introduction to the four-player co-op Firefight mode that first made its debut with ODST. If you've played any of the previous Halo games, most of the campaign experience will be instantly familiar to you. That's not to say Bungie hasn't changed anything, though. The flashiest addition is space combat. At one point during the campaign, you'll hop into a spacefighter to battle the Covenant far above Reach. While it's not complex enough to merit more than one appearance in the game, it's surprisingly polished and smooth. They've mapped out the flight and weapons controls on the 360 controller very well and it made me wonder why we don't have more space combat games on consoles. It's a fun diversion from the first-person shooter action that characterizes the rest of the 10 hour campaign. A more far-reaching change, though, is the armor ability system. They function like the power-ups from Halo 3 but they recharge so you can use them over and over. The default ability is a speed boost but you can swap that out for a jetpack, a decoy generator, and more. While you’re not always given much of a choice with the abilities during the campaign (usually you’ll only find two or three), they still have a big impact on the action. They’re an additional strategic decision you need to make. For example, will you attack the enemy head on with your decoy drawing fire or swoop down on them with your jetpack? These abilities resurface in multiplayer, with a key difference: you’ll often be free to choose your ability before spawn. New features are accompanied by needed tweaks. The large-scale battles of the campaign and Firefight mode are more entertaining when experienced with three other players. To ensure that everyone can enjoy the cooperative aspects of the game, Bungie has added matchmaking support. Reach also addresses the other issue that plagues many co-op games: difficulty. The co-op scales in difficulty according to how many players there are, preventing the game from being trivial or impossible. The campaign and Firefight in Reach are closely tied to the competitive multiplayer. Your accomplishments in all modes earn you credits. You can spend these credits on new armor pieces, allowing you to fully customize your appearance. By earning credits you also move up in rank, which in turn unlocks new additional armor parts for purchase. Bungie will provide weekly and daily challenges for the campaign, multiplayer, and Firefight that earn bonus credits. Granted, some players are going to be indifferent to customizing their character’s look. Still, I like the idea of all phases of the game (single-player, co-op, competitive multiplayer) all earning rewards for the player. There’s no hierarchy between the different modes; you’re encouraged to spend time with all of them. Reach’s Firefight is a big improvement over its ODST incarnation. Players now have a large array of customization options at their command to create unique challenges. In addition to choosing the time limit and amount of enemy waves, you’ll also be able to pick the exact composition of each wave. You can edit the traits of the A.I. or the players. Want to make the players super-fast or the enemies immune to headshots? You can do it. The catch, though, is that you can only use matchmaking for games with default settings. If you want to play a custom match, you’ll need to recruit your friends. Still, there’s a lot of variety offered in Firefight even with default settings. There are a number of variant modes, such as “Gruntpocalypse” (the enemies are all Grunts) and “Generator Defense” (you have to defend power generators from the waves in addition to surviving). There’s also a Versus type, in which four players take on the role of Elites and join the assault against the defenders. Though campaign and Firefight are both worthy of your time, many players will flock to the competitive side and never leave. They can’t be blamed. Bungie has added new modes to an already impressive list of Objective and Slayer modes. In “Headhunter,” you earn skulls by killing players. You have to then deposit these skulls at a special location in order to get bonus points. You’ll drop all of your skulls if you die, though. In “Stockpile,” teams must round up flags from around the map and put them at their base. Every minute, the flags at base will be collected and your team will get a point for each one. A new Arena mode offers a Major League Gaming style experience, with 2v2 and 4v4 matches that utilize season-based rankings. The new Invasion mode has gotten a lot of play pre-release. Invasion is an 8v8 mode with three phases. With each phase, new armor abilities and weapons are unlocked. One team must capture two sets of territories, and then steal a data core from the enemy base and take it to an extraction point. It provides an experience that’s a bit grander than the usual Halo fare and hopefully people keep playing it after release. One thing that might irk Halo 3 players is that they’ll have less maps to choose from initially. There were about two dozen maps available at the time ODST arrived. Reach has several less than that. Fortunately, it boasts a very robust map editor so players can create their own battlefields. Forge allows you to play and edit maps in real-time with your party. Instead of using an existing map as a canvass, though, you can create one from scratch with Forge World. Forge World is a huge environment, the size of multiple maps, where you can build freely. Making things even easier for amateur builders are the new options for editing, like being able to change the exact coordinates of an object or combine two objects. You even get a few credits for the time you spend in Forge. Maybe Bungie will revisit Halo someday. It’s hard to believe they won’t, after all the success the series has brought them. Still, if Halo: Reach was really their last game in this franchise, they should have no regrets. They’ve added what was missing, fixed what was broken, and given new toys to fans they’ve already spoiled. Their shoes are going to be hard to fill.